VATICAN CITY (CNS) — As Pope Francis once again urged new moms not to be afraid to breast-feed in public, he reminded people to pray for the world’s mothers whose poverty means they are unable to provide enough food for their children. 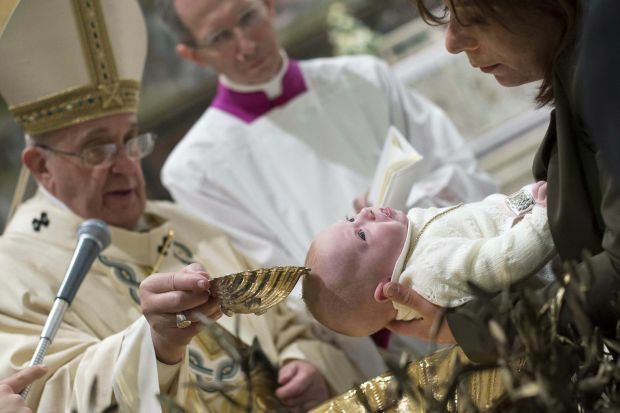 “Let us pray and try to help these mothers,” he said during a Mass in the Sistine Chapel in which he baptized 33 babies on the feast of the baptism of the Lord, Jan. 11. The pope’s homily focused on the meaning of baptism and the reading from the Book of Isaiah about how, like a good mother and father, God wants to give his children nourishment that truly satisfies. God did that by offering the nourishing word of Christ, the pope said. Parents and relatives should offer their children the word of God by always carrying with them a pocket-sized copy of the Gospel and reading a short verse from it every day, he said. “This will be an example for the children to see daddy, mommy, godparents, grandpa, grandma, aunts and uncles reading the word of God,” he said. “Let us thank the Lord for the gift of milk and let us pray for those moms — and there are many unfortunately — who are in no condition to feed their own children,” he said. He also told everyone not to forget to pray to the Holy Spirit, who supplies the strength to keep going in life’s journey. “Usually we pray to Jesus. When we pray the ‘Our Father’ we pray to the Father. But we don’t pray to the Holy Spirit too much,” he said. Later, before praying the Angelus with those gathered in St. Peter’s Square, Pope Francis said the baptism of the Lord opened up the heavens to reunite people with God. “Sin distances us from God and breaks the bond between heaven and earth,” he said. But when Christ was baptized, the heavens were “torn open” and the Holy Spirit descended upon him, giving everyone “the possibility of encountering the Son of God and experiencing all his love and infinite mercy,” he said. Christ is truly present and can be encountered in the sacraments, especially the Eucharist, and his face can be seen in the poor, the sick, the imprisoned and the refugee, Pope Francis said. He also asked that people pay greater attention and listen to the Holy Spirit. Otherwise, a Christian community that is “deaf to the voice of the Holy Spirit, who is urging people to bring the Gospel to the ends of the earth and society, will also become a Christian and a community that is ‘mute’ and cannot speak and evangelize” about Christ, he said.